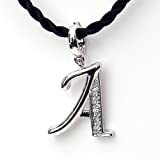 Diamond initial pendants are a great piece of jewelry to give as a gift, it’s definitely the type of jewelry that doesn’t appear to be going out of fashion any time soon. Initial pendants have long been a popular piece of jewelry, from Victorian lockets with initials engraved into them to the rock star style of ‘in your face’ initial bling that is often seen in this millennium. 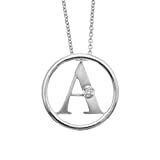 Men and women alike can enjoy wearing a piece of initial jewelry and a pendant is the best piece to give when buying a gift as you don’t have to worry about sizing. I used to have a very small, conservative gold initial pendant when I was young, but these days it seems to be all about the bling which is why my daughter keeps eyeing up initial pendants that are heavily encrusted in cubic zirconia! 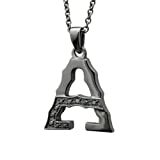 Have you ever owned an initial pendant? Adding diamonds to the initial pendants don’t have to end up looking like you’re a wannabe rapper, instead there are some very tasteful looking diamond initial pendants available, especially online. Although the saying is “Diamonds are a girls best friend…” the fact is that diamonds can easily be worn by both sexes as can initial pendants which means that combining the two makes perfect sense. As you can see opposite there are styles of initial pendants designed with a man in mind and the one pictured is a black sterling silver with 0.11 carat black diamond pendant. The diamond initial pendant comes with a 20 inches long sterling silver chain which is what I am told is the perfect length for fashion conscious men. Jewelry and women have a special love affair so it’s hardly surprising to note that there are far more different styles of diamond initial pendants for ladies to choose from. In fact it was almost too hard to decide on just a couple to showcase for you here, but I did my best! 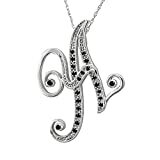 This initial pendant is a classic style made with sterling silver and diamonds it’s also rhodium finished which as jewelry enthusiasts will know helps to prevent the necklace from tarnishing. I love the fact that this pendant comes with a silk cord as it makes it look like something that a number of my (slightly) younger friends would wear for an every day necklace. This diamond initial necklace is simply gorgeous as it beautifully combines white gold with black diamonds which (in my opinion) is a match made in heaven. It comes on a gold chain which means it's ready to wear straight away - always good! 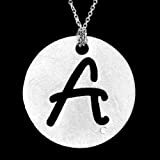 As I've said before diamonds look great on men and women alike so it's hardly surprising that some of the initial pendants should be available in unisex designs and I've selected what I think are the best two unisex designs for you below. Pretty cool pendants. I like the one with the white gold and black diamonds best. These are fantastic. I got my "D" when I graduated from High School from my parents. D for Digby and Diamonds. I just love it. Imagine your partner's reaction when you present them with the Heart of The Ocean! This iconic necklace from the Titanic Film is bound to leave them speechless!